Yeah, right. 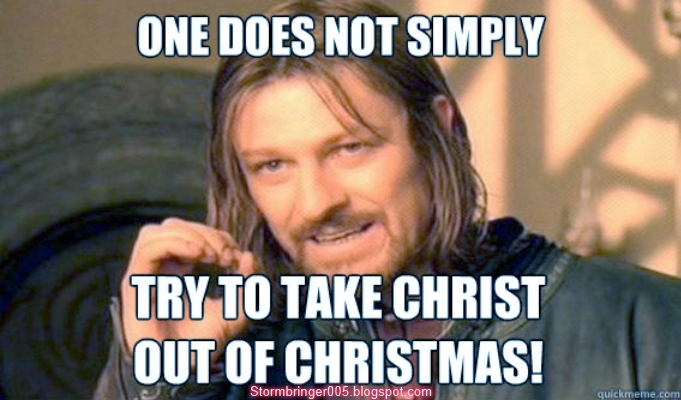 Stores wouldn't be having "Black Friday", people wouldn't be getting festive, decorations would not be put up, no special music if it wasn't for Christmas! The secularists and atheopaths want to take it away from us under the pretense of "someone might be offended". Get real. Drop the politically correct nonsense. Here's an idea, if you want to be consistent: Never call another holiday by name again. Always say, "Happy holidays", whether people are celebrating Arbor Day, Martin Luther King Day, Independence Day, the Queen's Birthday, Foot Fungus Day or whatever you have. "Boss, are you being sarcastic?" Oh, Tommy the Knocker joins in! Say hi to Tommy, class! Heh, you should know better than anyone about my sarcasm, Tommy. This is amazing. Truly. A troll came along, wanting to be immortalized. He pretended to be Joe Intellectual, and showed himself both clueless and foolish. In the initial attack, he simply fired off several questions that he obviously did not wish to have answered. Atheopaths do not do their homework. His questions contained assertions and biases as well as outdated, faulty "science". Also, this is a form of the fallacy of "elephant hurling". From there, he progressed to accusations. He did not answer the question. Here we have a personal attack and further faulty assertions. This one is simply precious: More assertions, a lie ("a couple of reasonable questions"), attempts to manipulate emotions, and a massive ego. Why are these people so narcissistic? It's amazing that they are not willing to do some research on any creationist positions, get up to speed on their own fundamentalist evolutionist dogma, or simply be quietly smug instead of acting like children who have been disciplined by the headmaster, and are pouting in the schoolyard. So, we have a winner for the most ludicrous, self-humiliating troll attack of the year! ADDENDUM: The troll uses logical fallacies, attempted manipulations and is basically an obstreperous, recalcitrant twit. So this stalker (he admitted to this earlier) is defending him! When this happens, I think that they are just as incapable of logic as the people they are defending. Worse, he is using additional fallacies like appeal to motive, argument from silence, ad hominem, sweeping generalizations asserted as fact, and more. (Amazing how they can pack so much foolishness into such a little bit of text!) He lies about my lying; the evidence is right there, in the guy's own words, Skippy. Since such behavior is consistent among atheopaths, I believe that it indicates some things: That types like this are more concerned with dogma and control than with reason, and that they are united in hate. They will never gain the respect of intelligent people. Edit: This stalker claims that he does not know where I have documented his dishonesty and irrationality, even though he complained about the posts, before. Here are a couple for you, Poindexter, the first and the second. Funny how they claim that I have nothing to say, and yet do not bother with over a dozen supporting links in some of these things. Another example of bigotry and intolerance. So much for a spirit of scientific inquiry. This bigoted atheopathic clown car spun in circles, skidded of the embankment and burst into flames. And they didn't even notice, instead, congratulating themselves with their arrogance.